1938 reg. 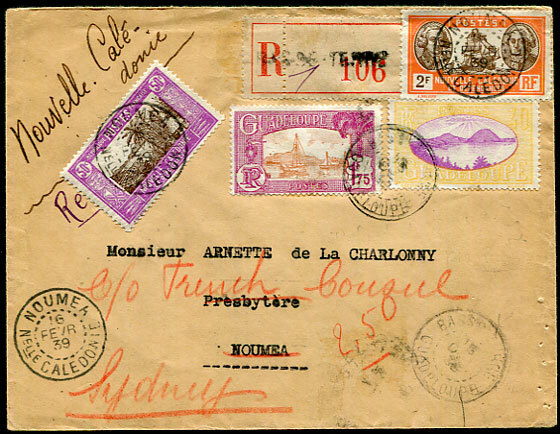 cover to Noumea, New Caledonia with Guadeloupe 40c, 1f 75c pmk'd Basseterre 18 OCT 38 arriving Noumea 20 DEC 38 (backstamp), re-directed to the French Consul, Sydney, New South Wales with Nouvelle Caledonie 50c, 2f pmk'd Noumea 16 FEVR 39 showing 23 FEB 39 arrival (backstamp). An exceptional combination of countries. 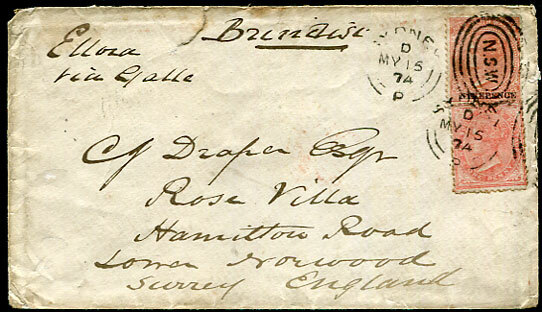 1874 cover "Ellora via Galle and Brindisi" to Lower Norwood, Surrey, England with NINEPENCE on QV 10d, QV 1d pmk'd Sydney D/MY 15 74, reverse London JY 10 74 arrival. Edge tear at top, soiling. When the new P&O contracts came into force in 1874 NSW refused to contribute to the P&O service because Melbourne was made the mail terminus, and because NSW favoured the route via San Francisco. 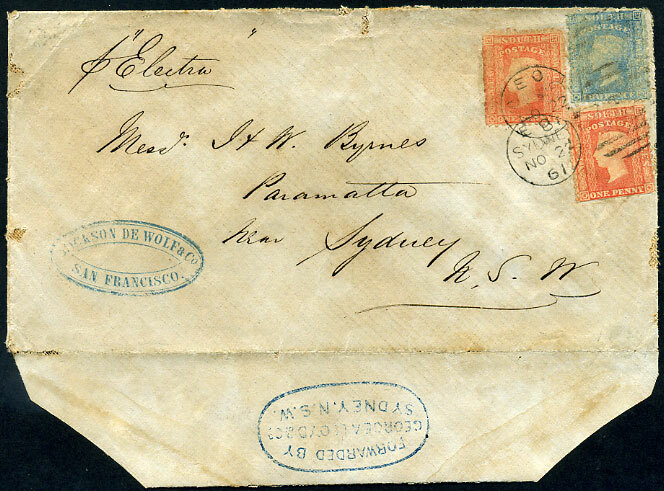 To use the route via Melbourne and Pt de Galle NSW had to pay a fee to Victoria based on the number of letters sent by that route. In order to defray that expense, and also to discourage NSW writers from using the route, a 1d surcharge was added to the 9d rate via Brindisi from February 10th 1874 to May 27th 1875. 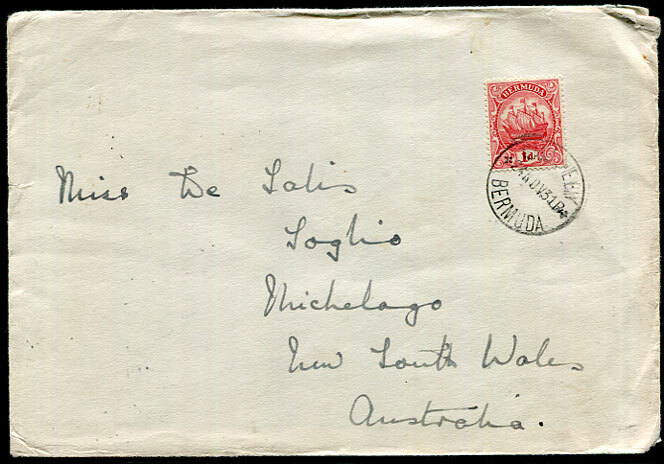 1931 (NO 24) cover with 1d Caravel pmk'd Mangrove Bay to Michelago, New South Wales, both fancy decorative inside and unusual diagonal perforation for opening, no backstamps. 1877 printed circular for two lots of land at Pottinger County (Premer Run and Moredevil Run) for SALE AT THE POLICE OFFICE, GUNNEDAH on May 2nd 1877 posted with exceptionally rare SG unlisted diagonally bisected QV 2d correctly tied Gunnedah AP 16 1877 "145" to James Wilson, Llangollew, Cassilis which can display TAMBAR SPRINGS (AP 8), COOLAH (AP 19), CASSILIS (AP 22) transits. Age marks and hinge reinforcements. 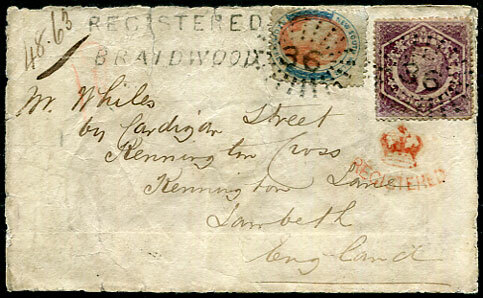 1863 cover to Lambeth, London with QV 6d plus (6d) REGISTERED pmk'd "36" with handstruck REGISTERED/BRAIDWOOD and red (crown)/REGISTERED applied on arrival, reverse Braidwood JA 19 1863 despatch clear of missing flap. Worn appearance. Ex Martin WILLCOCKS (1999). 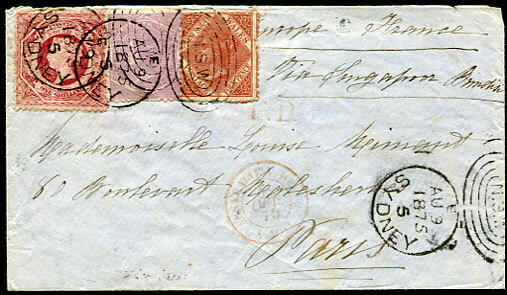 1875 cover to Paris with three colour franking of 4d, 6d, 1/- pmk'd SYDNEY AU 9 1875, no flap. 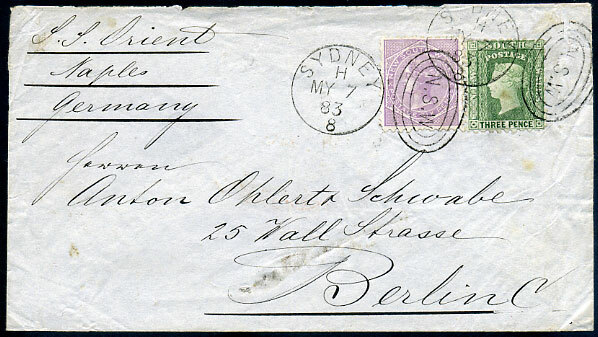 1883 cover via Naples to Berlin, Germany with QV 3d, 6d pmk'd SYDNEY HMY 7 83 duplex. 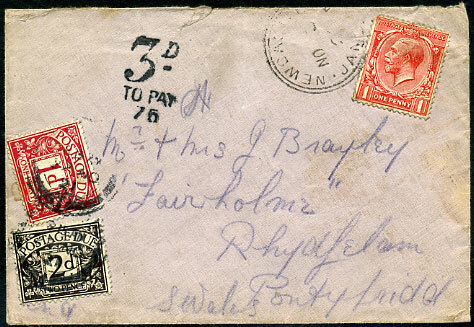 1921 cover with incorrectly added GB KGV 1d (perf. 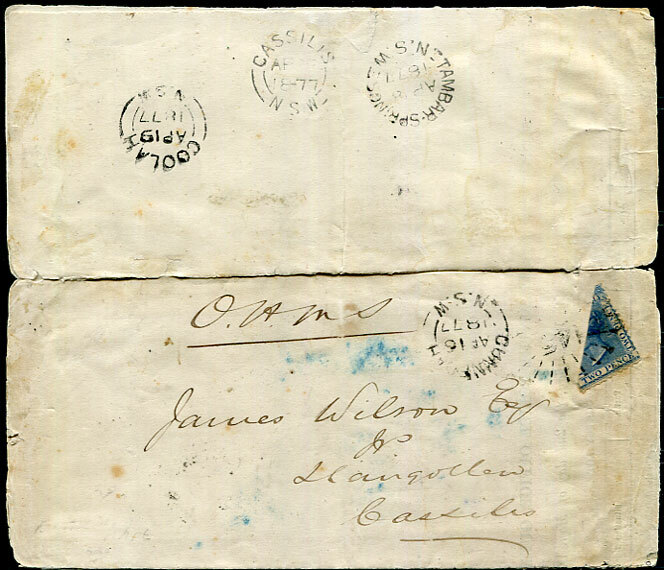 faults) to South Wales just tied NEWPORT, JAMAICA NO 5 21 d/ring, tax handstamp and GB 1d, 2d Postage Dues tied 22 NO 21, soiled. 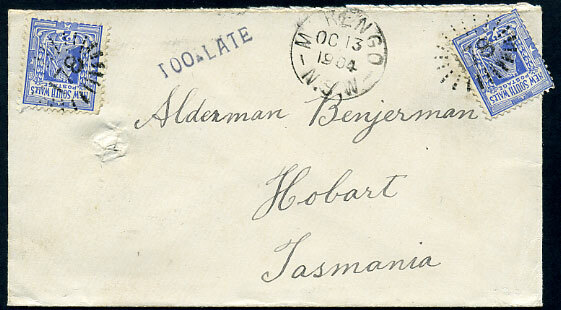 cover with 2 x QV 2d to Hobart, Tasmania dated OC 13 1904 with handstruck "TOO-LATE". 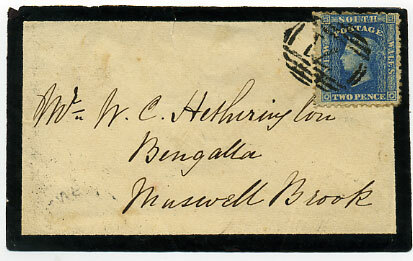 1860 mourning cover to Muswell Brook with perf. 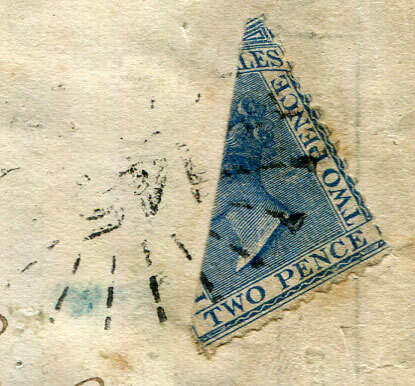 Plate II QV 2d tied Tamworth "71" numeral, b/stamped MR or MY 22 60, part flap removed. FORWARDED BY/GEORGE A. LLOYD & Co/SYDNEY, N.S.W. 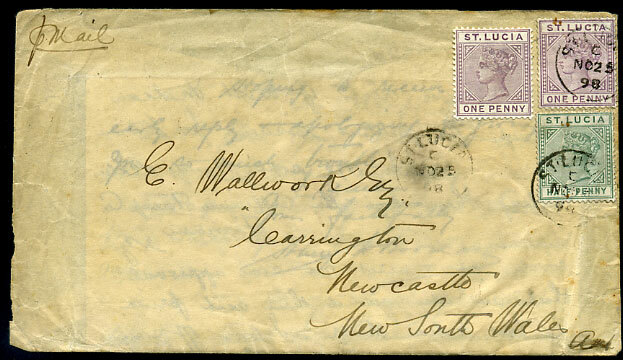 blue in oval cachet on lower flap of 1861 cover from San Francisco p. Electra to Parametta, N.S.W. The agent affixed the 2d and 2 x 1d adhesives for the onward 4d inland rate between ½oz and 1oz. 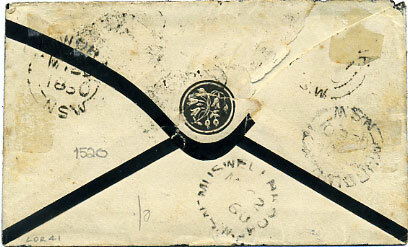 Cover a little aged etc but believed to be the only example of this rare cachet. 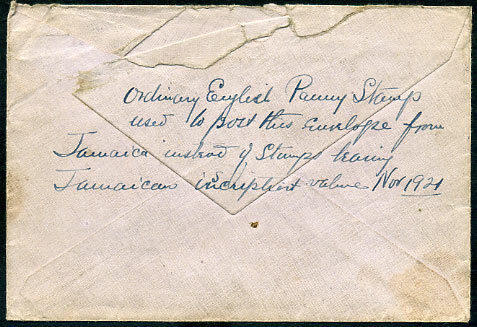 with enclosed letter bearing QV ½d and 1d (a further uncancelled QV 1d has been removed and replaced by hinged example) pmk'd C/NO 25 98, b/stamped JA 11 89 arrival.